Still two months out, the UFC 128 fight card is filling up fast. 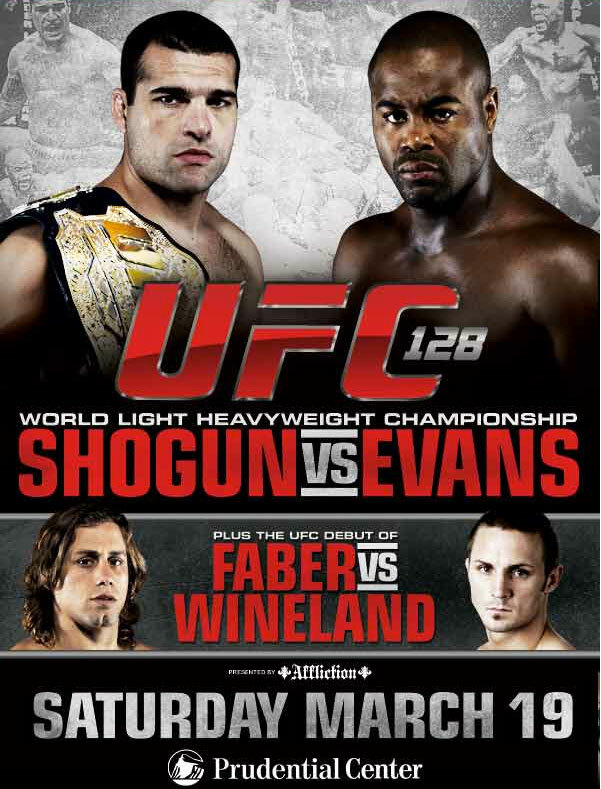 The main event light heavyweight title bout between current champion Mauricio “Shogun” Rua and Rashad Evans and the co-main event featuring bantamweights Urijah Faber and Eddie Wineland were already announced, but the Ultimate Fighting Championship recently added other prominent fights to its return to New Jersey. Perpetual UFC middleweight contender Nate Marquardt, coming off of a loss to Yushin Okami, will face Yoshihiro Akiyama on March 19 at the Prudential Center. Akiyama has been less than stellar in his UFC tenure. He enters the UFC 128 fight losing back-to-back bouts to Michael Bisping and Chris Leben. The fight is expected on the UFC 128 main card on pay-per-view, rounding out a roster that will also likely include Mirko “Cro Cop” Filipovic vs. Brendan Schaub and Jim Miller vs. Kamal Shalorus. A key featherweight fight has also been added to the UFC 128 preliminary card. Top 10 ranked Manny Gamburyan will face Raphael Assuncao in a 145-pound showdown. Gamburyan won his first three fights when he dropped down to the weight class, but hasn’t fought since losing his bid to capture the title from Jose Aldo last September. Assuncao comes into the fight riding a win over LC Davis in November.